The basketball season has begun at Lincoln School so that means it is time for the School Spirit Pep Club to spring into action! The club is open to students in grades 4 through 7 and is led by Mrs. Benc. 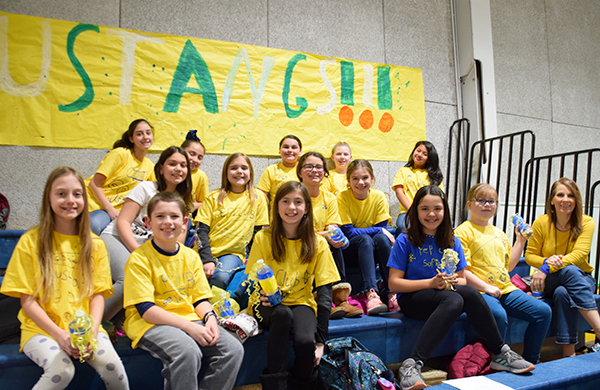 Members of the club met several times to create banners and posters to display in the gym in support of the school’s girls’ and boys’ basketball teams. They designed a club tee shirt, made water bottle shakers, and learned a few cheers that they perform from the bleachers during games. (above) The Pep Club at one of the recent home basketball games, wearing their original tees while cheering for the Lincoln School Mustang teams!